There are many ways to share your ArcGIS Pro work. You can share packages, such as project and geoprocessing packages, to exchange content and tools directly with other ArcGIS Pro users. You can also share maps, layers, and styles to the web for workflows that integrate desktop, online, and mobile apps. You can share items publicly or with your ArcGIS organization. In this tutorial, you'll share a web map with your ArcGIS organization and view it on the web and in a mobile app. Mangrove is a type of ecosystem that contains valuable natural resources and diverse animal species. The mangrove is a unique environment and interesting to ecotourists, so the conservation of this land cover is important. You'll share a map of mangrove locations and walking trails on the North Island of New Zealand. 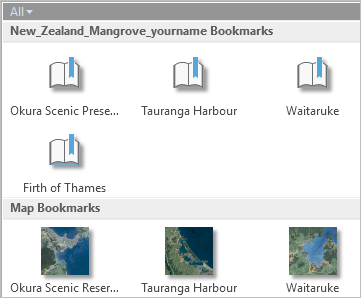 If you completed the Author a map tutorial, you can use the project you created (New Zealand Mangroves) for this tutorial. Open the project from your list of recent projects on the ArcGIS Pro start page or browse to it by clicking Open another project. If you use your own project, skip the first section of this tutorial and begin with Prepare the map for sharing. You may notice minor differences in images and names, but the steps will work. At the top of the dialog box, in the Search box, type Share a web map tutorial and press Enter. In the list of search results, click Share a web map to select the project package. 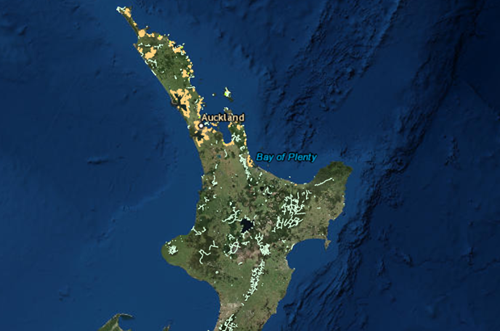 The project opens with a map zoomed in on the North Island of New Zealand. On the ribbon, on the Map tab, click Bookmarks . Go to each of the three bookmarks to see different views of the mangroves. 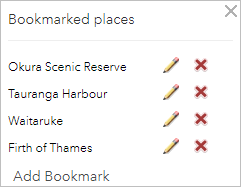 When you're finished, go back to the Okura Scenic Reserve bookmark. This will be the default view for your web map. When you share a map as a web map, the web map includes the layers from your ArcGIS Pro map, as well as settings or properties of the map, such as bookmarks. You may want to share a single layer from your map. You can do this by using the Sharing > Share As Web Layer command on the layer's context menu in the Contents pane. In this tutorial, you'll share your map as a web map. On the ribbon, click the Share tab. In the Share As group, click Web Map . The Share As Web Map pane appears. At the top of the Share As Web Map pane, click the Map tab if necessary. 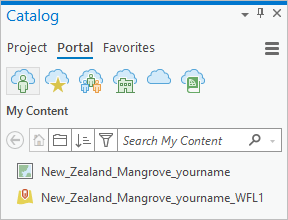 In the Name box, replace the default name with New_Zealand_Mangrove followed by an underscore and your name or initials. In the Summary box, type Mangrove accessibility from walking trails. In the Tags box, type the following keywords: trails, mangrove, New Zealand. Make sure the keywords are separated by commas. Press Enter. Under Select a Configuration, make sure Copy all data: Exploratory is selected. Exploratory—A web feature layer is created from feature layers in your ArcGIS Pro map. Users can change properties of the web layer, such as its style (symbology), and can perform analysis on it in ArcGIS Online. Features and attributes cannot be edited. Editable—A web feature layer is created from feature layers in your ArcGIS Pro map. Users can change properties of the web layer, perform analysis, and edit features and attributes in ArcGIS Online. Visualization—A web tile layer is created from all layers in your ArcGIS Pro map (excluding basemap and reference layers). Users can view the layer in ArcGIS Online but can't change its properties or analyze or edit it. There are more configuration options if you're sharing to an ArcGIS Enterprise portal. See Share a web map for more information. Under Location, click the drop-down arrow and choose yourname (root). Optionally, you can share the web map to a different folder or create a folder in your portal content. Under Share with, check the box next to the name of your ArcGIS Pro organization. The name of your organization is used, not the literal text Organization Name. At the top of the Share As Web Map pane, click the Configuration tab. Under it, click the Input Layers tab if necessary. You see the items that will be created in your portal account: a web map and a web feature layer with sublayers corresponding to the three feature layers in the map. Click the name of the web feature layer (New_Zealand_Mangrove_yourname_WFL1). The Properties button becomes available. Clicking Properties allows you to change general properties of the web layer, such as its name, and to configure specialized properties, such as editing, sync, and export options. You won't change any properties in this tutorial, but see Share a web feature layer for more information. Click the name of the Trails sublayer. The Split button becomes available. This button allows you to create separate web feature layers instead of a single web feature layer with sublayers. In this case, however, you will share the default single web feature layer. At the bottom of the Share As Web Map pane, under Finish Sharing, click Analyze. Errors and warnings appear on the Messages tab. Errors prevent sharing and must be fixed. Warnings, such as 24041: Layer does not have a feature template set, may affect the web map performance or display but don't prevent sharing. You can right-click a warning or error to open a help topic. In this case, you need to expand the warning and right-click one of the three warnings grouped under it. The warning appears three times because it applies to each sublayer in the web feature layer. Sharing the map to your portal does not use service credits. After the map is shared, minimal service credits are used to maintain it in storage. In the Share As Web Map pane, under Finish Sharing, click Share. Progress is displayed at the bottom of the Share As Web Map pane. The process may take some time depending on network traffic, connection stability, and other factors. Occasionally, a job may fail and need to be shared again. To monitor the sharing process more closely, click Jobs under Finish Sharing to open the Job Status pane. When the map is shared, a success message appears at the bottom of the pane. On the success message, click Manage the web map to open a browser window or tab. Sign in to your ArcGIS organization. 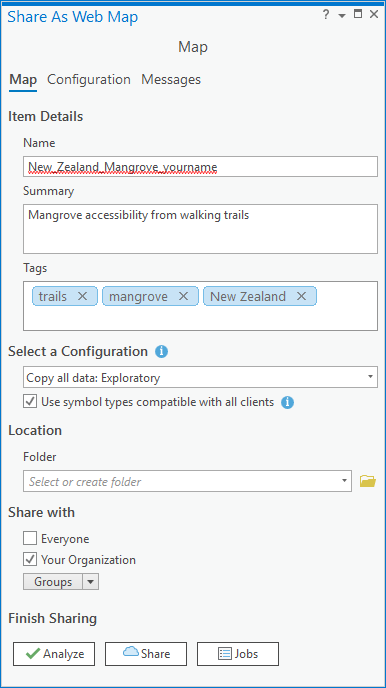 In the Edit Description text box, type or copy and paste the following: Map of mangroves and walking trails on the North Island of New Zealand. Trail segments within 150 meters of mangrove are indicated. You'll open, explore, and modify the web map in ArcGIS Online. You'll also look at the items created in your portal content. At the upper right of the item page, click Open in Map Viewer. At the top of the Contents pane, click Legend to see the map legend. The layers have the same names and symbols as in your ArcGIS Pro map. Widen the Contents pane if you don't see the text labels for the buttons at the top of the pane. In the row of tools above the web map, click Bookmarks . Click each bookmark to zoom to it. Pan and zoom to explore the map. You'll add one more bookmark to the map. In the search box above the map, type Thames, Waikato, NZL, and press Enter. The map zooms to the old goldmining town of Thames on the east side of the Firth of Thames. Close the search result pop-up on the map. Pan to the west and zoom out to show the mangroves and trails on the southern shore of the Firth of Thames. Click Bookmarks and click Add Bookmark at the bottom of the drop-down list. In the text box, type Firth of Thames and press Enter. Close the list of bookmarked places. Zoom out so that all of the North Island of New Zealand is visible. Click the Save button and click Save on the drop-down list. In the upper left corner of the page, click the Home button and click Content. On the Content page, on the My Content tab, you see the items created when you shared the map: the web map, the web layer, and a service definition file. 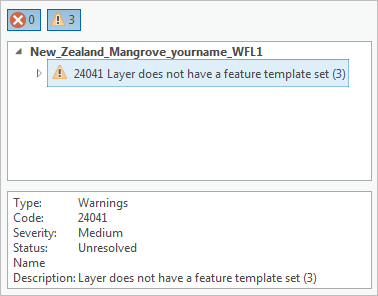 Click the name of the New_Zealand_Mangrove_yourname_WFL1 web layer to open its item page. On the Overview tab, under the Layers heading, you see the three sublayers of the web feature layer and options for working with them. On the right side of the page are more options for working with the web feature layer. The available options depend on your role in the ArcGIS organization and on configuration settings made in ArcGIS Pro when you shared the map. For more information about these options, see Manage hosted feature layers in the ArcGIS Online help. Keep your web browser open to ArcGIS Online. In this section, you'll add your web map to ArcGIS Pro and check for the new bookmark you made in ArcGIS Online. Later, you'll make a symbology change in ArcGIS Online and update the web map in ArcGIS Pro. In your open ArcGIS Pro project, in the Catalog pane, click the Portal tab. Under the Portal tab, make sure the My Content tab is selected. Your web map and web feature layer appear in the list of content. If you don't see the web map, click the Menu button and click Refresh . If there are many items in the list, you can also search for the map by name. In the Catalog pane, right-click the web map and click Add And Open . The web map is added to the project. You're finished with the original version, so you'll close it. Hover over the view tab for the original map and click Close . The original map is preserved and can be opened again from the Maps folder on the Project tab of the Catalog pane. In ArcGIS Pro, the web map can be difficult to distinguish from a map created from local data. You'll check to verify that both the map and its data are hosted online. At the top of the Catalog pane, click the Project tab. Expand Maps . Your project contains two maps. The one called Map is the original, locally-hosted version. The other one, New_Zealand_Mangrove_yourname, is indicated as a web map by a link in its icon. In the Contents pane, click List by Data Source . The data sources in the current map are services, meaning the data is hosted online. The first service is the location of Esri basemaps, and the second is the web feature layer in your portal. In the Contents pane, click List by Drawing Order . Now, you'll check for the new bookmark you added online. On the ribbon, click the Map tab. In the Navigate group, click Bookmarks. Bookmarks are displayed from both maps in the project. In the list of bookmarks, under New_Zealand_Mangrove_yourname Bookmarks, click Firth of Thames. The map zooms to the bookmarked location. In ArcGIS Pro, on the Quick Access Toolbar, click the Save button . You may decide to make additional changes to the web map in ArcGIS Online. Anyone using the web map in ArcGIS Pro will be notified and can update their map when a new version is available. In this section, you'll change the symbology of a layer in the web map in ArcGIS Online and update the map in ArcGIS Pro to see the change. If a newer version of a web map is available from ArcGIS Online, it's up to you to accept the notification and update your map in ArcGIS Pro. Doing so will overwrite any changes you've made to the web map in ArcGIS Pro: if you want to preserve these changes, save the map as a map file before updating it with the new online version. In your ArcGIS Online web session, at the top of the page, click Content. 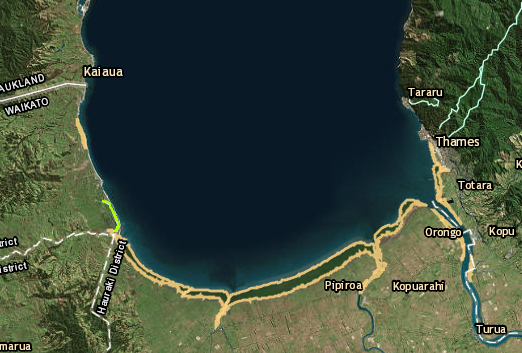 On the Content page, click the New_Zealand_Mangrove_yourname web map. On the web map's item page, click Open in Map Viewer. The map opens to show the most recent extent you viewed online: the North Island of New Zealand. At the top of the Contents pane, hover over the Trails Near Mangrove layer to see the available commands. Options include opening the layer attribute table, changing the style, and performing analysis. Click the Change Style button . In the Change Style pane, under Select a drawing style, click Options. Under Showing Location Only, click Symbols. On the symbology dialog box, choose a bright magenta and change Line Width to 2 px. Click OK on the dialog box. In the Change Style pane, click OK and click Done. The trails near mangroves change color to reflect your choice. You may need to zoom to a bookmark to see the result. Click Save . On the drop-down menu, click Save to save the web map. You'll be notified in ArcGIS Pro that the online web map has changed. The notification appears when you close and reopen the map in ArcGIS Pro or when you close and reopen the project. 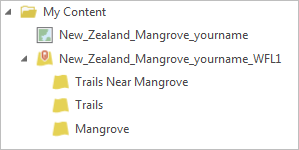 In your open ArcGIS Pro project, close the New_Zealand_Mangrove_yourname map. In the Catalog pane, on the Project tab, under Maps, right-click the web map and click Open to reopen it. In the upper right corner of the ArcGIS Pro window, the Notifications indicator has a blue dot. This means you have a notification. The Notifications pane appears. A message in the pane tells you that a new version of your web map is available. Hover over the expanded notification and click Update Map. On the Update Map Or Scene prompt, click Yes. The map updates to reflect the symbology change made in ArcGIS Online. You can also update a map in the Catalog pane. On the Project tab, under Maps, right-click the map and click Update . Your web map can be opened in various apps on different devices. You can open it in ArcGIS Pro, in ArcGIS web or mobile apps, or in your own app. This section of the tutorial is optional. Explorer for ArcGIS is a free app, but it uses space on your mobile device. The images and steps in this section describe an Android workflow; you'll need to make minor adjustments if you have a different operating system or mobile device. Install Explorer for ArcGIS from your device's app store. The map card shows the map's title, its creation date, and a thumbnail image. You can use Overflow to see map details or add a map to your favorites. Click the map's thumbnail image to open it. On your own, see what you can do with the map in Explorer for ArcGIS. Zoom to bookmarks , turn layers on or off, and use Overflow to make measurements or change the basemap. Mark up the map with sketches and add notes.